How ITIL can help SMBs to streamline IT Service Support? Information Technology Infrastructure Library (ITIL) is a framework of best practices to manage IT operations and services. Government of Commerce, UK defined ITIL in the mid 1980s for business to efficiently manage their IT environment. ITIL 's main objective is to align business and Information Technology. ITIL's IT Service Support process helps organizations to efficiently manage software, hardware, and human resource services to ensure continued and uninterrupted business. ITIL defines that the core function of IT Service is to offer "uninterrupted and best possible service" to all users. It defines 5 processes such as Incident Management, Problem Management, Configuration Management, Change Management, and Release Management to offer uninterrupted and best possible service. ITIL does not mandate enterprises and organization to implement all the framework specifications. This freedom to choose is one of the prime reasons why ITIL is still very relevant even today to enterprises of all sizes. SMBs need to have a cost savings approach to ITIL implementation; this approach helps them to adopt the right features without getting caught in standards-sake ITIL implementations. Here is an illustration that shows how SMBs can manage an IT environment with an ITIL-based Service Support solution. Consider an Office with users having IT and non-IT assets. Consider that IT and non-IT asset services are handled by the IT Support team and Quality of Service offered is at an excellent level. The Excellent QOS is an end result of the IT Support team and all the components such as IT, non-IT assets, and complete IT infrastructure functioning at their best. As shown in the illustration, all requests from users are classified as Incidents and problems, a workaround is suggested to ensure that normal operations and services are not affected. Problems are traced to their root cause and a Change is initiated to eliminate problems and related incidents. Using ITIL's Incident, Problem, Configuration, and Change Management, the IT Support staffs continually ensure that all components perform at their best level, to contribute to the Excellent Quality of Service. Most SMBs start with a modest email-based IT Support setup, but as they grow and as service requests increase, the quality of service drops drastically. The IT support team gets into a fire-fighting mode, just resolving requests to avoid service failure. Without ITIL, there is no vision to proactively identify and resolve problems before it affects service and business. ITIL provides the framework or the "common sense approach" to IT service support so that each issue is analyzed to determine the root cause. Finally, the root cause of the problem is eliminated to prevent similar problems in the future. Enterprises need to plan ITIL implementation with clearly defined short term and long-term goals. This helps enterprises to stay focused on their vision with every step and on the whole move. A simple plan with the following key points can help SMBs to stay focused and implement ITIL successfully. How do we get where we want to be? Define high-level objectives you need to move towards. These objectives can help you define and refine your goals. Take a baseline statistics of Key Performance Indicators. Track statistics and trends to measure KPI. Average Service downtime in a week, month, quarter, and year. Implement a Help Desk solution with asset management and network monitoring software to drill into problems and resolve them faster. Check how many users logged in to Self-service portal to solve their issues and analyze how it reduced your level1, level 2 calls. Enterprises can implement an ITIL based Help Desk for proactive IT service management and to reduce service downtime. Consider a financial services company with multiple teams of employees. Employees are spread across two floors and all employees have a workstation to run their applications. Employees access a shared resource pool of printers to print out cheques or transaction reports. Employees print cheques often as they sanction loans and provide financial reports to customers. Workstation or printer failure can be critical for business. Let us see how IT Help Desk staff can implement an ITIL-based Help Desk solution to identify and manage service requests, eliminate problems and provide uninterrupted service. When an employee sends a request saying that he is unable to print. There can be various reasons why he is unable to print, the service staff needs to ask the right questions to understand and pin point service problems. Here are a few possibilities. An incident is an event that it is not part of the standard operation. It interrupts or reduces the Quality of Service. 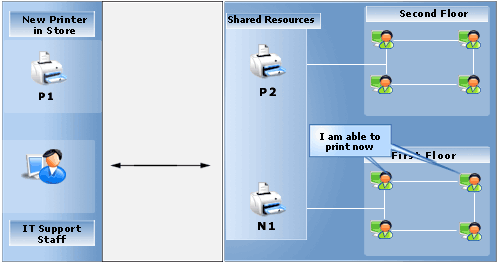 In this instance a single user being unable to print, this affects the user alone and might not affect business in a big way. This event only reduces the overall QOS from Excellent to Good, so this event can be classified as an Incident. The Office operations are not affected in a big way by Incidents, as only a single employee is affected in this case. But when another employee or a group of employees send requests communicating that they are unable to print. In this case, when the second incident is raised, a basic check is performed with the knowledge base for matching incidents. If there are matching similar individual Incidents pointing to a single point of failure. This might be classified as a problem as it might adversely affect business as a group of employees are affected. The Support Staff must provide resolve the situation to restore the QOS. After asking the Right Questions and getting the Right Details, the support staff zero in on the problem. Say if there is a printer malfunction that is causing the problem. 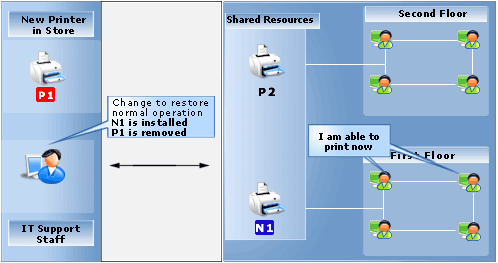 The printer needs to be replaced and normal operation must be restored to affected users at the earliest. The main goal of problem management is to find the root cause of the problem proactively and eliminate all the related incidents. The Support staff can get back configuring the workstation or rectifying or by providing users an alternative way to print. The goal of problem management is find the root cause of the problem and to eliminate incidents and prevent further incidents related to the problem. The CMDB is one integrated database that contains all the details about employees, workstations, devices, incidents, problems, changes, and complete details of all the components in business. It provides a public Knowledge base of Known errors and solutions that help employees search and resolve minor incidents themselves with out contacting the Help Desk. It provides private knowledge base for the Support Staff get detailed reports about all assets with problem history, work-around and temporary fixes. 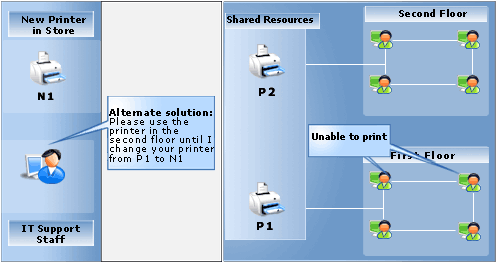 Now employees are given a workaround to print, still the problem remains and points to the printer. A detailed report with workstation and printer problem history from the CMDB shows that the printer has been failing repeatedly. 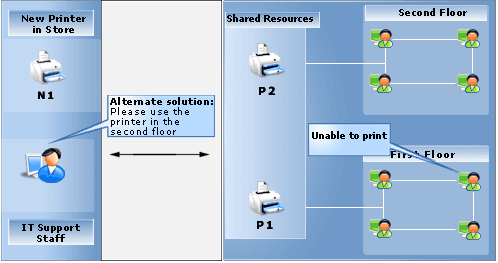 To eliminate the problem, the printer needs to be changed and replaced with a new printer to restore normal services. A change is initiated to resolve a problem and a proposal is raised to replace the old faulty printer with a new printer. A proposal to change printer is submitted for approval, the approver can be IT manager or COO based on the cost of purchase. A detailed plan is prepared to implement change with a roll-back plan acting as a safety net. After implementing the change, the requestor needs to verify that change was successful. change plan is implemented on non-business hours so that there is a minimal business impact. Once the Requestors verify that implementing the change eliminated the problem. The change request is closed. Enterprises can continually ensure excellent QOS by implementing Incident, Problem, Configuration, and Change management process to efficiently and proactively handle service requests. 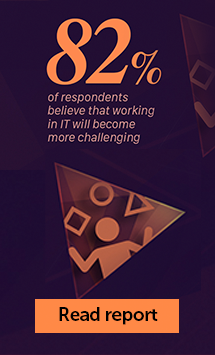 Growing SMB with an expanding IT environment often struggle to provide uninterrupted IT services to users. Enterprises need to adopt a standards based solution to handle their IT services. 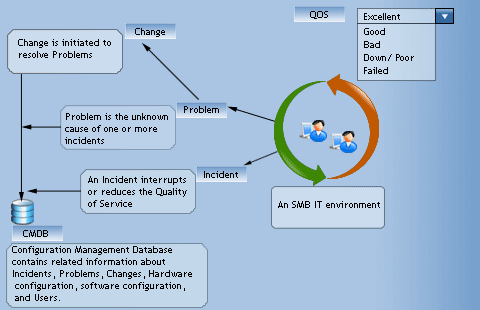 "Chaos Management with ITIL" shows how enterprises can plan and implement ITIL to proactively handle issues using Incident, Problem, Configuration, and Change Management and maintain excellent QoS. Getting back to Bob, ITIL can help Bob manage IT Services, no matter how big his IT environment expands. It can help Bob and his team, resolve problems faster and prevent a few from even arising. Thanks to Javier Garcia Arcal for his reviews and comments. Javier Garcia Arcal is an independent Senior ITIL Consultant, he consults for large government and private corporations in Spain. He collaborates with Nebrija University (www.nebrija.com) handling part time courses on PMBOK (Technology Project Management). With his extensive experience in ITIL, Javier works part time as a trainer helping aspirants take the ITIL Foundation Exam. He is a major contributor at www.itlibrary.org and www.itilcommunity.com forum. Contact Javier Arcal at javier.arcal@gmail.com. ITIL Help Desk SMB White Paper - View PDF.